A few months ago, a Beyond Salmon reader asked me why she couldn’t find a single eggplant recipe on my blog. I have nothing against eggplants, I assure you, but they have fallen out of favor with Jason way before I knew him, so I’ve avoided cooking them ever since we met. But my knight in shining armor has been conquering all the weird veggies at a frightening speed. There are so few left that I am not sure what I am going to do once he starts eating them all. It’s always been a bit of a sport for me to get him to eat asparagus, cauliflower, beets, and other denizens of the vegetable kingdom, and I will miss the challenge of inventing the most irresistible, mouth-watering dishes to get certain veggies on Jason’s good side? Getting an eggplant in our CSA share gave me excuse to use try the cooking technique I picked up from Chef Ruth-Anne Adams during my internship with her. Jason bravely ate a bite. And then another one. And then eggplant was no longer on the forbidden veggie list. In fact, it is now welcomed in our house with open arms. Note: Aleppo chili that this recipe calls for is available in Middle Eastern markets. It’s not spicy at all, but sweet and musky. If you don’t have it, substitute it with a pinch of Spanish smoked paprika, or skip it all together. Peel stripes of skin off the eggplant to create a zebra like pattern of skin and no-skin. This is not only decorative, but makes the skin easier to bite. Slice eggplant into ½ inch thick circles. Lay out a large sheet of paper towels. 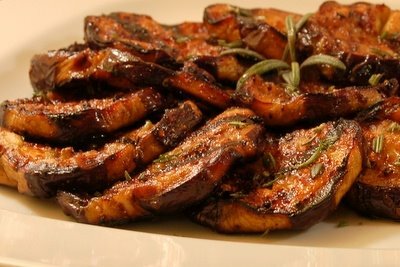 Sprinkle eggplant generously with salt on both sides and lay out on paper towels. The eggplant will release a lot of liquid. This will help get rid of bitterness (if any) and make the eggplant more succulent and less watery after it’s cooked. Let sit for 15 minutes, then dry both sides well with paper towels. In a large bowl, mix honey, olive oil, garlic, chili, balsamic vinegar, salt and pepper to taste. Dunk both sides of each eggplant slice into this marinade. Preheat the grill to high. Grab a wad of paper towel with tongs, dip it in oil, and brush it on the grill. Place the eggplant slices on the grill, cover, and turn down the heat to medium. Grill until marked, about 3 minutes. Turn 90 degrees to make cross-hatch grill marks. Grill until marked, about 3 more minutes. Brush the slices with remaining marinade, flip and repeat the grilling procedure on the other side. Regulate heat so that the eggplant is browning, but not burning. Remove to a plate, and drizzle with olive oil. Sounds like a definite candidate for my grill. BTW, you can order Aleppo peppers from Penzeys. Looks beautiful & delicious. Thankfully it's cooling down a bit here so firing up the grill won't make the entire area feel like a furnace! Thanks for letting me know about Penzeys. I haven't tried them yet because I live next door to 3 Armenian and Middle Eastern Markets, but it's good to know that it's possible to order more obscure spices on-line. I love eggplant, and this looks so beautiful! The lazy cook in me loves the simple and available ingredients (apart from Aleppo, which you say can be skipped). Thanks! I LOVE eggplant. I usually just grill it with olive oil, salt and pepper, but I'll have to do it this way. It's hardly any more effort. I liked reading about your Jason trying new veggies. My husband is a very adventurous eater, but it has been fun to see him grow to love eggplants, beets and squash as much as I do. Thanks for the eggplant recipe! I've been dying to make something (anything!) with eggplant. Perhaps I'll go to the Farmer's Market near work tomorrow and pick up an eggplant or two to make this. Hi Helen - you know, I've never been a big eggplant fan but this recipe still really beckons to me... I think I'll have to try it and break free of my non-eggplanted-existence. hope all is well! Yum, what a great way to prepare eggplant- very unique. I'm back. Just letting you know that I am spotlighting this recipe as one of my South Beach Recipes of the Week where I feature SB friendly recipes from other food blogs. It includes your photo (with a photo credit for you, of course) and a link back to the recipe. Looks fantastic! We tried this recipe a few times and served it to guests - everyone loved it. We don't own a grill (yet), but just did it on a Forman's grill and it still worked out beautifully. I think the drying it out first is what makes a big difference. I am getting people (my boyfriend is one) to eat eggplant the never eat eggplant. This is great and let me use a host of Chinese eggplant that I didn't know what to do with. great recipe! my husband loved it so I am making it again. I don't have a grill where we are so I grill in the oven--just be sure to use nonstick spray! I got stuck on carmelized juices last time and had to run to the store for brillos pads! Excellent recipe. I made it tonight and we enjoyed it thoroughly. BTW - I substituted in the smoked paprika and it was excellent. I just tried this tonight, it was awesome! This was really good. We didn't have the Aleppo peppers so we used three parts sweet paprika and one part cayenne. I also added that to the rice we served it with. Great idea for something new to do with eggplant! I generally like my eggplant on the salty side, but if it bothers you, salt lighter. You can even try not salting at all, but it might effect the texture (the bitterness is not usually a big problem). I made this and did substitute smoked paprika (from Penzey's). My husband, who doesn't like eggplant, asked for seconds! This was delicious! And even better with eggplant from my garden. I just had a variation of this at a fine restaurant and they serves some warmed goat cheese in between the eggplant, tossed a few toasted walnuts on the plate and garnished with 6-8 fresh spinach leaves. It was heaven. I plan to make it this way next time. Wonderful flavors! (Smoked paprika worked well as a substitute for the Aleppo peppers.) Enjoyed this on the grill tonight, and will use the marinade again in the future. This turned out awesome! I didn't have Aleppo Chili so I used some Garam Masala that I had from another recipe. I can't wait to use this marinade for other dishes. Would this be a side or a main dish? If it's a main do you have a suggestion for sides? I prepared this recipe today with Japanese eggplant (nasubi) for use in a tomato sauce pasta dish. This was AMAZING! And so easy. I left out the Aleppo peppers, and it was good. I'm sure WITH them, it'd be even better. This will be on our go-to list! Didn't have the aleppo chilli so i used the smoked paprika instead (actually found it at vons)and OMG IT IS SO DELICIOUS, I CAN'T TELL YOU!!! I want to use that stuff on everything now--i even experimented and tried it on grilled peaches. it has such a smokey sweetness to it that is perfect with any grilled item (i'm grilling some sweet potatoes for a party tomorrow...i bet the smoked paprika will be great on that too. i'm gonna keep it in my spice rack all the time now. I checked for a substitute for the aleppo... hoping to use something i had on hand. Best suggestion was 4 parts sweet paprika with 1 part cayenne pepper! Perfect! AMAZING! I had been looking for ways to enjoy eggplant, outside of baba ganoush, and I am SO pleased to have found your Honey Garlic Grilled Eggplant. Grilled them over hardwood charcoal last night and they turned out fabulous. I too had to substitute paprika[hungarian] for the aleppo, but look forward to finding some Aleppo now! This dish will be repeated, much thanks! I'm looking forward to making this tonight with one reader's suggestion of garam masala! For the reader that thought it was too salty, I always rinse my eggplant after I sweat it to get rid of the extra salt, then pat dry. Excellent marinade and if you double the recipe it is awesome as a bread dip. Also, regular paprika works. I made this last night on the grill! It was amazing! I put the glaze on the eggplant and salmon and feasted! Thank you for a great recipe!